"What is the minimum amount of money to buy a stock? Where and how?" -- Kaly from Calgary, Canada. This is one of the most commonly asked questions from CNNMoney readers. Many people want to become the next Warren Buffett, but they don't know where to begin investing or even how much money they need to make the first purchase. "We really encourage people to have six months of savings first," says Yvette Butler, president of Capital One Investing. Once you have a few thousand in savings, then you can start investing. The goal of investing is to make your money grow faster than it would in a typical bank account (especially since savings accounts barely spit out a little more than 0% interest now). But investing is risky. You can lose money, especially in the "short run." How to invest: Once you have the cash, an explosion of trading apps has made it easy to get going. "We wanted to make our service accessible" to anyone, says Vlad Tenev, co-founder of the app Robinhood that allows you to buy and sell stocks for free. You just have to have enough money to buy the stock you want (e.g. $56 for Starbucks (SBUX)). Robinhood launched in March 2015. It already has about a million users. Tenev says many begin by investing just a few hundred dollars as a way to dip their toes in and learn. Over time, they add more to their portfolio. How to get going with just $5: If you really want to start small you can use an app like Stash or Acorns. Both allow you to begin investing with just $5. Stash offers you a choice of several funds to invest in. You basically end up owning part of a stock -- similar to sharing your apartment with roommates. Acorns allows you to deposit "spare change" from say, your coffee purchase. When you get to $5, the app invests that money for you into a diversified portfolio (basically, a mix of stocks and bonds). How to get great advice: Feeling too intimidated to pick your first stock or fund? There are a lot of great -- and cheap -- services that will do it for you. Betterment and Wealthfront are good examples. They use computer models to figure out the best portfolio mix for you based on your age, income, goals and tax situation and they will invest your money for you. "The way people invest is changing dramatically," says Jon Stein, founder and CEO of Betterment. "We optimize your gains, net of fees." Betterment doesn't have a minimum balance requirement, so you can start with just a few dollars. 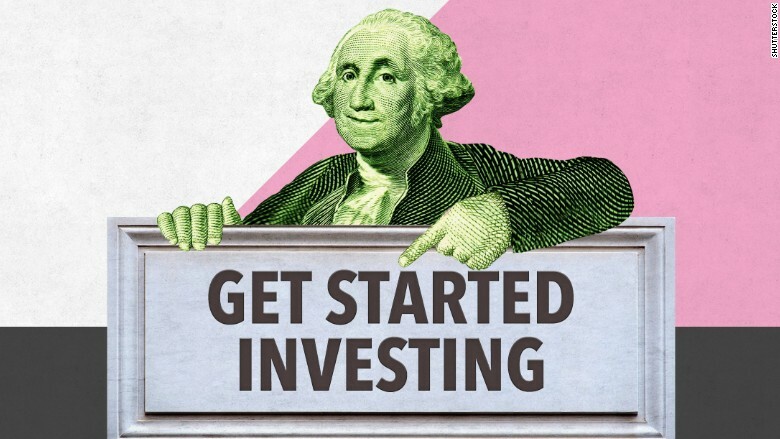 Wealthfront requires $500 to get going. More established players like Fidelity, Charles Schwab and Vanguard are lowering their prices and offering more options to cater to "new investors," especially Millennials. You can call them up or stop by an office in your town to discuss what to do. Just remember: Always check the fees. If you only want to buy $500 in Apple stock, you don't want to get charged a $7.99 fee when you can buy the stock on an app for free. What to buy: Figuring out what to buy is tough. There are roughly 2,400 stocks traded on the New York Stock Exchange alone. The easiest option is to buy what's known as an ETF (an exchange-traded fund) like SPY (SPY). It trades like a stock, but it means you own a basket of stocks. In the case of SPY, the basket is made up of 500 of America's largest companies. Sure, a few might struggle, but all 500 probably aren't going to tank at the same time, so it helps lower the risk. Another common option is to buy the ETF of a sector of the economy such as QQQ (QQQ) for tech stocks or EEM (EEM) for emerging markets. Buying individual stocks is riskier. If the stock falls, you can lose a lot of money. Of course, you also gain a lot of money if it goes up. The most popular stock by far is Apple. Other widely held ones are Facebook (FB), GE (GE) and Disney (DIS). Keep in mind: About half of Americans have money in the stock market, but only 14% own individual stocks.